Summary: Indulgent, creamy, lightly lemony and pretty, this is an elegant comfort dessert for a special occasion. This won a 1st place Blue Ribbon in the professional division of the annual 2013 Malibu Pie Contest & Festival. Make crust: In a mixing bowl, toss together the crumbs, butter and cinnamon until all crumbs are slightly moist. Spray the bottom and sides of a 10-inch springform cake pan or cake pan with removable bottom liberally with a good quality non-stick spray (she prefers Vegelene or Bakers Joy). Spread and pat down the crumbs into the bottom of the pan. Set crust aside. Make filling: In the bowl of a counter-top mixer (such as a KitchenAid or other brand) add cream cheese, mascarpone cheese and sugar. Mix on medium speed for 4-5 minutes until creamy and smooth, scraping down sides. Add eggs and yolk, one at a time, scraping the bottom and sides after each addition. Add zest and vanilla and mix for 30 seconds. Pour mixture into the cake pan with crust, and bake at 350 degrees 60+/- minutes (until just set). When cake is done, remove from oven onto a rack to cool. While cake is baking, make compote and glaze: Add 1 basket blueberries into a saucepan with sugar, butter and vanilla. Cook on low for about 5 minutes until berries pop and create a sauce. Remove from heat and cool. When cool, fold in remaining basket fresh blueberries and fresh raspberries. Set aside. For glaze, mix together crème fraiche and sugar in a small bowl and set aside. Recipe and photo by pastry chef Kristine Bocchino of V’s restaurant + bar in Malibu . She also does desserts for Duke’s in Malibu, Casa Escobar in Westlake and (coming soon) Casa Escobar in Malibu. Eggless Herb and Garlic Fresh Pasta  from Sarah at What Smells So Good? 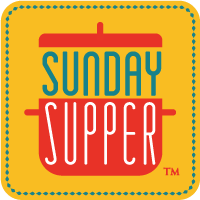 Pinterest: Check out our #SundaySupper Pinterest board  for more recipes and photos. 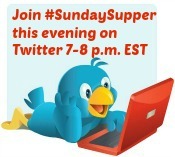 Join: To join the Sunday Supper Movement, sign up by clicking here → Sunday Supper Movement .